I’m not sure how many more times I’ll need to answer that question, but let me just say that my answer will never change: No. I feel very strongly that photography needs to be a source of pleasure, and my pleasure from photography comes from discovering beauty in its natural state. But that’s just me—others enjoy staging images by adding or moving elements to suit their composition, which, as far as I’m concerned, is fine as long as the photographer is forthright about what she’s done. Sadly, the ease of digital manipulation has made people hyper-sensitive to the possibility that an image might not be “real” (whatever that means). 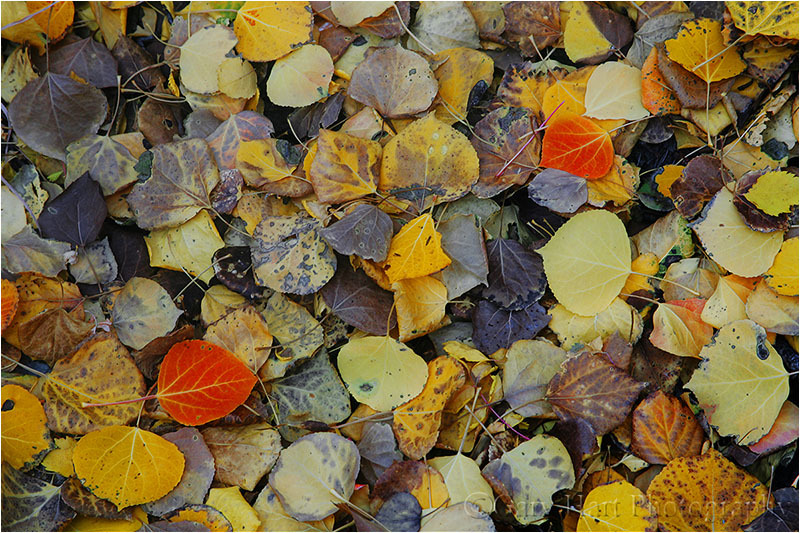 Analog manipulation (like arranging leaves) has gone on since the first photon/film connection. And darkroom manipulation, while not nearly as easy as digital manipulation, has been around since the first darkroom—Ansel Adams was a notorious darkroom manipulator who often revisited older images and re-printed vastly different versions. Adams actually got a kick out of people who believed he was capturing the world exactly as he saw it. Whatever the “manipulation” (a word with a much more negative implication than it deserves in this context), the ultimate litmus test is whether deception is involved. Most people who arrange the elements in their scenes do so without devious intent; while I may not be as excited about an image when I learn that the photographer placed the leaf on that rock, or Photoshopped the moon above between those mountains, I won’t think less of him as a person or photographer if he’s honest about it. Here’s one that gets the “Did you do that?” question all the time. I didn’t touch the leaves, but because any two objects in the Universe can be connected by a straight line, I did position myself to emphasize the line connecting this pair. Oh well. I’m sure I get the question so much because of what and how I shoot—browse my galleries and you’ll see many images with a single leaf, or maybe a small group of leaves. But that’s because I aggressively seek solitary elements to isolate from whatever larger scene I’m in, or multiple elements that I can compose into a natural pattern by simply positioning my camera a certain way. When I find a compositional element I think will work, I stick with it until I’m sure I’ve found every possible way to shoot it, then continue just a little longer. Which brings me to today’s leaf. I photographed it and nothing else for a full hour—it was the only thing I photographed that morning. On the final morning of last week’s Yosemite Fall Color and Reflections workshop I guided those workshop students who didn’t mind a little rock scrambling to my favorite spot on Bridalveil Creek. Within easy earshot of the fall, the creek back here tumbles between boulders as large as cars, descending in cascading steps interrupted by quiet pools. In autumn, the scene is augmented by yellow leaves that dart through the cascades, drift on the pools, and cling to wet rocks. While the others zeroed in on a triple cascade (that I’d photographed many times before), I hopped nearby boulders in search of something new. My search ended when I found this single, rock hugging leaf. Unfortunately, the star of my show was in a most inaccessible spot, inches from the rushing water at the bottom of a steep and slippery rock, deep in a narrow notch between a trio of large boulders. It was clear from the outset that securing my tripod in the open air above the leaf would require help from three widely separated rocks. After much trial, error, and imminent mishap, I finally managed to splay each tripod leg onto its own rock with the camera in positioned directly above the leaf. Okay, now what? There was no way I could even get close to the viewfinder, but spread-eagled between two rocks and using the tripod for balance (but not for support), through the genius of live-view, I was able to get close enough to my LCD that I was pretty sure I could compose and focus. So far so good. I next removed the camera from the tripod to meter. With Bridalveil Creek in the shadow of six-hundred vertical feet of granite (in these low-sun months I can photograph here in low contrast, full shade for most of the morning), my exposure choices were pretty straightforward. I guessed that I’d need a least a foot of depth of field, that my camera would be about five feet above the leaf, and that my focal length would be around 80mm. Plugging these values into my hyperfocal app told me f16 would give me the one-and-a-half feet of depth of field I thought I’d need. Experience with workshop students has shown me that many photographers vastly underrate the value of a polarizer in a shaded scene like this (and vastly overrate its value for the sky!). Without a polarizer, the glare on the wet rocks and leaf risked rendering this image unusable (even with the scene fully polarized, the glare remains quite noticeable). So, before returning my camera to the tripod, I oriented my polarizer by pointing my camera in the direction of my scene, looking through the viewfinder, and turning the polarizer’s outer ring until the wet rocks darkened. At this distance and focal length, with water moving as fast as this, there’s virtually no difference in the blur effect between 2 and 20 seconds. Given that I see little noise difference between 100 and 200 ISO, rather than exposing 20 seconds at 100 ISO, I went with 10 seconds at 200 ISO for no better reason than it halved the wait time for each image. Okay. Camera back on the tripod, I switched on live-view and found my composition. Moving the focus box to the leaf, I magnified 10x and focused carefully. Almost ready, but before clicking I returned to 1x view and reevaluated my composition. Then I clicked, evaluated, refined, and clicked again. But even with the LCD a few feet away I could see that those first couple of meticulously composed and focused attempts were slightly soft and framed wider than I knew I’d composed them. Hmmm. I double-checked my tripod and confirmed that everything was solid. Scratching my head, I recomposed and focused once more. Watching my camera closely this time, I saw that the extreme downward angle was causing the telescoping barrel of my 24-105 lens to slowly extend during my exposure. Crap. Camera back off the tripod, I retreated from my perch. Returning to my camera bag, which was safely balanced on a rock about ten feet away, I switched to my 70-200 lens. While switching lenses was a pain, not only did it solve the drifting problem, the longer lens forced me to tighten and simplify my composition to its most basic elements: one leaf, two rocks, water. And variations on those elements are pretty much what I did for the next hour or so. The longer I worked the scene, the more variations I found, and also the more adept I became at adjusting my tripod, camera angle, and even myself, to achieve whatever shot I wanted. Every once in a while I descended to assist someone in the group (leaving the tripod and camera, thank-you-very-much), taking advantage of the break to relieve my cramping legs, back, and neck. By the time I finished my muscles were screaming and my hands were little pink ice cubes, but I was happy. I walked back to the parking lot knowing I had some really nice images. And despite all the effort and discomfort, I had a complete blast. But please, please don’t ask me if I put that leaf there. Definitely worth all of the effort! I love the simplicity. Beautiful image, glad you persevered. Interesting…did you intend for the “offending person” in the 3rd paragraph to be only female? lol. You could have broke something…………….Great work! Amazingly rewarding time consuming work..
beautiful photo! did you put the leaf there?? Beautiful image Gary, and worth all of the extended effort. Just reading this makes me want to hop on a plane head for Bridalveil creek! I get so mesmerized and focused when I am taking pictures like that… I get kind of “lost” in it… and can go for hours… and as you probably remember… time tends to slip away from me. This is a great shot, Gary! …. and really… does it truly matter if you move a leaf a little bit? 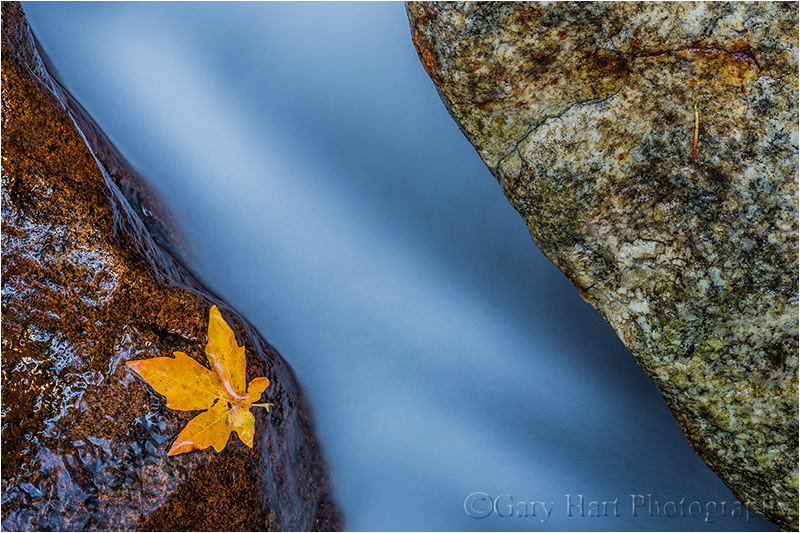 As long as it is in its true element… But I will always know that Gary Hart does not manipulate his photos… I on the hand am guilty of placing a leaf in just the right spot if needed… Maybe I am just not as agile as you! You are an awesome mentor Gary! Can’t wait for the next workshop! Beautiful! Thanks for sharing your adventures.